Emotions were raw. Tension ran like an electrical current through a Seattle City Hall conference room crowded with police officers, camera crews and journalists. One by one, community members came forward to make their case to the Landmarks Preservation Board: The Liberty Bank in Seattle’s rapidly gentrifying Central District was worth saving. When Michelle Purnell-Hepburn, former Liberty Bank employee and daughter of the bank’s cofounders, spoke during the 2014 meeting, she asked the board to think of the vision and bravery required to establish something as radical as a minority-owned bank in the 1960s. “Non-white individuals could not walk into any financial institution and expect a loan,” she said. Purnell-Hepburn didn’t want the bank’s legacy, and what it meant to her community, to be forgotten. The Board agreed and voted to deny landmark status 6 to 5. Murdock was at the meeting with members of Beyond Integrity, a group organized in the wake of the Liberty Bank decision. Beyond Integrity launched under the auspices of Flo Lentz, then in charge of preservation at 4Culture, the cultural funding agency for King County. Beyond Integrity was created to back up her observation with data. At the October Landmarks Preservation Board Meeting, Beyond Integrity members Brandi Link and Dana Phelan presented the results, collected from 2016–2018 by paid 4Culture interns, for one of the first times in public. With orange and blue pie charts behind them, they spelled out the issue in clear terms. Of Seattle’s more than 400 landmarks, only one mentions a connection to LGBTQ history: the Gaslight Inn on 15th Avenue, which was used as a place for families to stay while attending funerals during the AIDS epidemic of the ’80s. One. 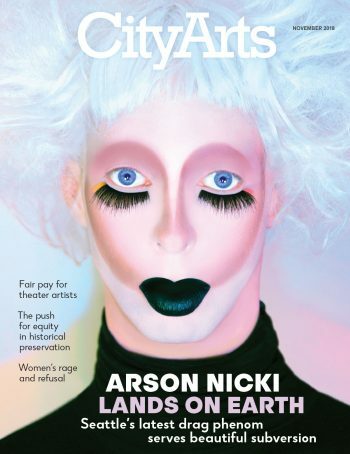 A jarring number for a city that wields its queer culture as a marketing tool. The numbers are equally distressing for ethnic minorities. African Americans make up around 7 percent of Seattle’s population and are represented in 4 percent of historical landmarks; Asian Americans comprise around 14 percent of the population are represented in 6 percent. Those numbers are close to zero for Native American and Latinx groups or individuals. On the whole, properties associated with underrepresented groups—defined by Beyond Integrity as women, people of color, the LGBTQ community and the working-class—are less likely to get designated. “Many of these communities were not in a position to build these monumental, sturdy buildings that survive over time,” says Manish Chalana, associate professor Urban Design & Planning at the University of Washington and an early member of Beyond Integrity. These so-called “common” or “vernacular” buildings were built out of necessity—meaning that accessible materials and functionality trumped high style—and therefore had or have, by federal standards, a smaller likelihood of preservation based on architectural value. In her 2017 thesis, Michelle Yellin, also a member of Beyond Integrity, discusses the First Hill multifamily housing complex Yesler Terrace as an example of vernacular architecture. Completed in 1942, most of the architecture included modest, wood-framed two-story row houses. Though it made history as the first racially integrated housing development in the country and was unique in the attractiveness of both its location and layout, it was rejected from Landmark status for integrity issues—because significant changes had been made since the ’40s. It does in the eyes of many preservation officials. Many believe lack of “architectural integrity” equals a lack of historic value. Beyond Integrity shifts value from architectural grandeur to spaces built in vernacular style and values cultural significance as much as impressive structures. This, they believe, will give way to a more accurate understanding of the past and a way for everyone’s history to be honored. On the corner of E Spruce Street and 20th Avenue, Stephanie Johnson-Toliver is pulling weeds from in front of “The People’s Wall,” a mural adorned with the words “Love, Unite, Respect, Build” and a Malcolm X portrait. “This was the perimeter of the second headquarters of the Seattle Chapter Black Panther Party, where they ran their free medical clinic,” Johnson-Toliver says. “Artist Dion Henderson was commissioned by the SCBPP to paint the wall.” The original building, a fortified duplex, was razed almost immediately after the party moved their HQ to a nearby house, but part of “The People’s Wall” remains. With financial and practical support from 4Culture, the Black Heritage Society of Washington State is working to nominate the wall for landmark status, along with two other headquarters of the Seattle Chapter Black Panther Party, early next year. In late July a developer filed for permits to supplant longtime downtown music venue the Showbox with a 44-story apartment building. A petition to save the venue from demolition racked up more than 80,000 signatures. A chorus of calls to “Save the Showbox” reverberated on Twitter, Facebook and among members of the City Council. As a city, what do we save and who do we prioritize? That system is a layer cake of compounding problems and hurdles to the disempowered. To Brothers, it’s a system of ownership and capitalism. The problem, according to Chalana, goes back to the philosophical issue of interpreting history through our obsession over our built environment. On a more tangible level, it boils down to protocols written and executed largely by the ruling class. The roots of this imbalance reach deep. Of the 12 non-paid, volunteer positions on the Board, eight require a background in real estate and finance, architecture, architectural history and engineering—fields that notoriously skew white and male. All of this is compounded by the fact that we live in a city where everything is up for grabs. The development frenzy adds time constraints to both the Landmarks Board and nominators of buildings. Often developers submit nominations with the goal of preventing landmark status so they can then simply demolish the building in question, sometimes leading to a race of who can submit first and thus control the narrative (better). 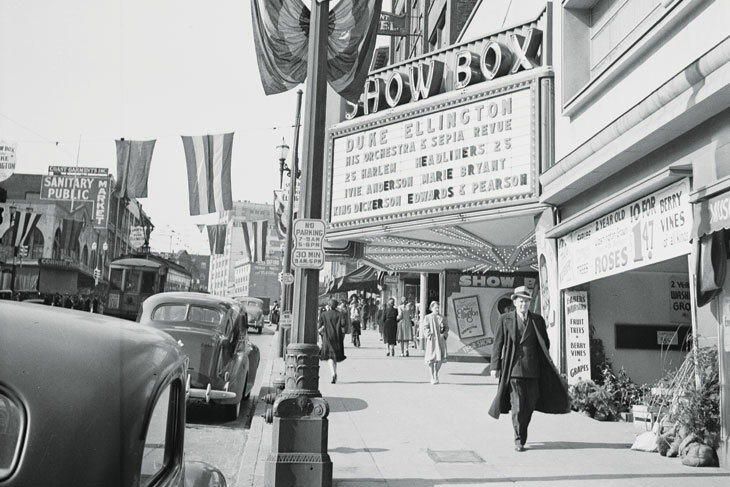 In the case of the Showbox, Historic Seattle and other preservation activists submitted a nomination report to landmarks staff first, further setting the tone for their campaign. But not everyone can fall back on support from Pearl Jam and Jack White. Lunchtime is almost over and Occidental Square exudes a certain desolation. Rich Freitas scans the empty parking lot on the corner. The buildings that stood there nearly a century ago housed Atlas Steam Bath and Columbus Tavern—queer gathering spaces. “These are ghost spaces now,” Freitas says. When we walk past Smith Tower, Freitas tells me there was a gay bar in the basement, the Submarine Room. The Tower’s landmark designation doesn’t mention any of this history. 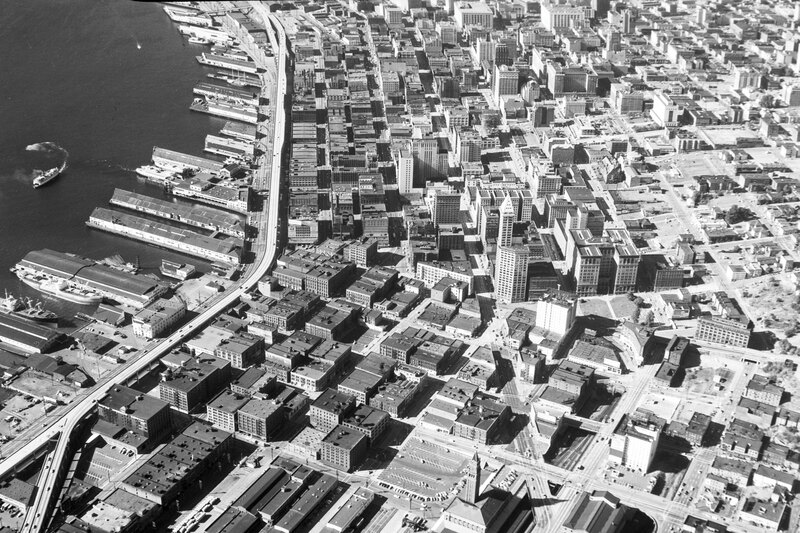 Unlike Smith Tower, most buildings that housed queer spaces in the 20th century were more vernacular, such as the famed Double Header, said to be the oldest operating gay bar in the country until it closed in 2015. Today it’s empty. Unlike the Double Header, some spaces Freitas described in his thesis don’t exist anymore, and others, still standing, lack markers that identify their previous use, begging the question: How do we tell the story of what happened in those buildings without the structures, or other markers, as tangible mnemonics? Some in the preservation field want to update official records of landmarked buildings and historic districts. If we can’t make amends, we can make amendments. Just as anyone can theoretically nominate a building for landmarking with a historic dossier, anyone could add more historical information to an already-landmarked building, which would be a simpler process. With support from 4Culture, Beyond Integrity hopes to add information about the 1985 occupation of the Colman School, now the Northwest African American Museum, to the original landmark designation dossier. There are other options beyond updating the historical record. Next year, Historic Seattle will organize tours of Pioneer Square’s queer spaces in April and June, along with a panel discussion about the history, changing use of and preservation/pressures on queer cultural spaces in Pioneer Square and Capitol Hill. The Black Heritage Society is supporting development of walking tours around Central District history, says Johnson-Toliver, who also points out that the Shelf Life Community Story Project is capturing the oral history of everyday residents. Other more “intangible” ways of honoring heritage, suggests Freitas, who wants to go “beyond plaques,” could include LED lights embedded in pavement or step lights in the sidewalk’s furnishing strip that could activate at night—a reference to the neighborhood’s nightlife. Other options are temporary exhibits and outdoor movies screened during Pride Week and, following the example of New York, a crowdsourced map of important historical and current queer spaces. Most of the time, plaques, maps and tours end up as inexact proxies for something long gone. To avoid making do with scraps in 10 years, says Chalana, we need a mentality shift now. The history of the everyday is worth saving along with the history of yesterday and today. In some cases, architectural preservation is self-preservation.